BITLIP focuses on creating musical, listenable sounds that people can dance too. Coming from a background in both jazz and cut-and-paste sampling he tries to combine the controlled spontaneity of musical improvisation with the textural eeriness of found sounds. His influences are quite wide, ranging from minimalist techno, classic rap, Steve Reich, Alice Coltrane’s spiritual music, Bach and Schoenberg, funk, jazz, and bluegrass to noise. Many of his compositions start life as livecoded adaptations of contemporary songs and end as bass-heavy, unfamiliar, cross-genre compositions with a focus on live energy and drama to keep people on their toes. 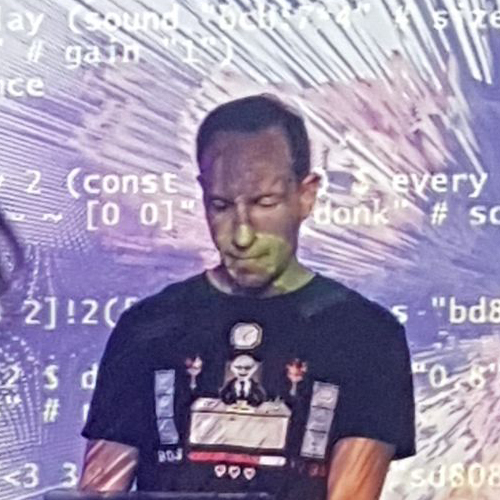 BITLIP uses the livecoding platform TidalCycles for sequencing and patterning his sounds and his own fork of the “SuperDirt” SuperCollider system for Tidal. He is a firm believer in the community of open source sharing built around livecoding and posts all his performance and practice code on his github. BITLIP (Evan Raskob, b. 1977 in New York, USA) has been playing music since he got his first violin at age 7. He played guitar in high school (taking lessons from the guy who learned from the guy who was lead guitarist for Dream Theater). He played jazz in university went on to create new musical interfaces for his own custom computer audio-visual instruments and to perform in New York City venues alongside established musicians. Now, besides livecoding, Evan help with Tidal meetups in London, teaches design and interaction as a Tutor at the RCA and is undertaking a PhD at Goldsmiths in ACT.